Bigger women are furious that they are being made to pay more than smaller people for clothes. IT ALL started when Maria Wassell noticed that a pair of green-striped pants from UK fashion retailer New Look were more expensive in sizes 16 and over than the same pants in a smaller size. 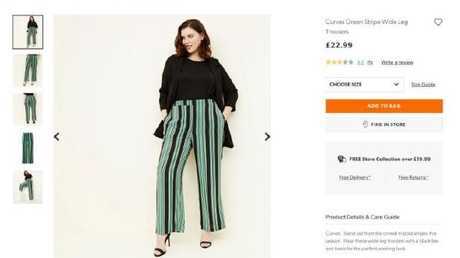 Ms Wassell was "absolutely disgusted" to find the same pair of pants cost £22.99 ($40) in New Look's Curves range, but just £19.99 ($35) in their standard range. The larger New Look green-striped trousers. 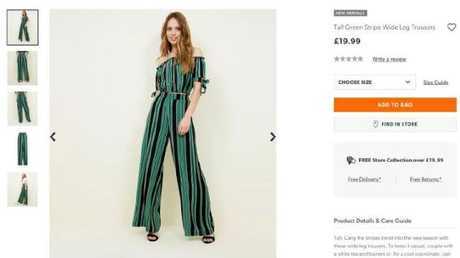 She also claims she paid £12.99 ($22) for a size 18 striped T-shirt that was being sold for just £9.99 ($17) in the standard range - a 30 per cent difference. In Britain and Australia the average woman is a size 14-16. According to the ABS, the average Australian woman is 161.8cm tall and weighs 71.1kg. "It's like I'm being discriminated against for being plus size when I'm only slightly bigger than average," Ms Wassell told The Sun. "Plus size purchases are on the increase. If you look at the statistics, there's more money being spent on plus size clothing now then there was even three years ago," Ms Wassell said. "Why should we be penalised for being slightly bigger? A lot of retailers do this. Some retailers have claimed that plus size clothes need more fabric and that's why it costs more. That's basically rubbish." She called the price discrepancy a "fat tax" and said bigger women should not have to pay more for clothes than smaller women. New Look said in a statement: "We are in the process of reviewing the pricing structure of our Plus Size collection in a way which works best for our customers and our business. The furore has lead female customers to ask: How do retailers price clothes fairly and should smaller people pay less? 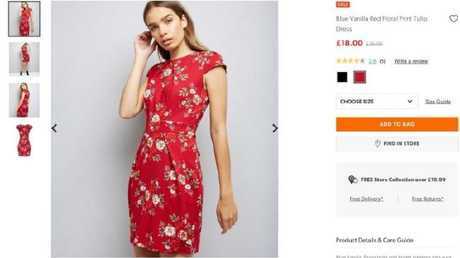 Another item priced differently by New Look was this red floral dress. Dr Kate Kennedy from RMIT University did her research masters and PhD in sizing and also sits on the Australian Standards Size Committee. She says that in order to price clothing fairly, retailers figure out how much it will cost them to make an "average" size and go from there. 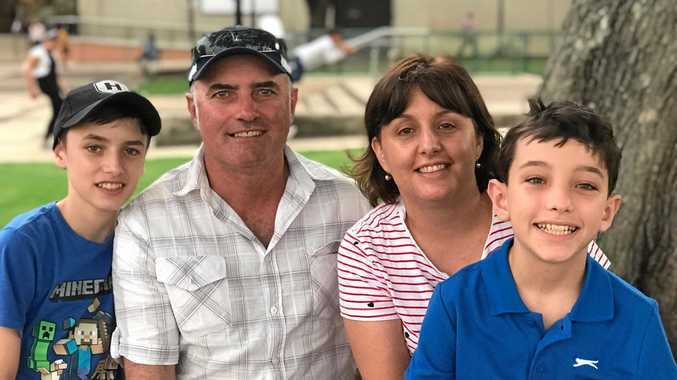 "You gain a bit for the small people and add a bit for the bigger people," Dr Kennedy told news.com.au. "It kind of evens out. You get your costs based on your average size and then it depends how many big sizes you're producing and how many smaller sizes. So yes, I guess the smaller people are paying for the bigger sizes." 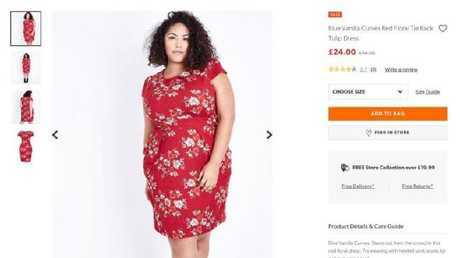 Many new online retailers have capitalised on the booming "plus-size" clothing market and launched "inclusive" fashion lines in a wide range of sizes, while maintaining prices the same across the board. Khloe Kardashian launched a clothing line called Good American last year, with a size range from 00-24. A newcomer to fashion designing, Kardashian and her business partner Emma Grede said one of the challenges was ensuring all their sizes were priced the same. "It was one thing coming up with the idea and another thing actually making it happen. You've got all sorts of issues," Ms Grede told Fortune. "At the end of the day you're using sometimes two or three times the amount of fabric and how do you do that from a costing perspective?" she said. All sizes in Good American's range cost the same, but the boutique range is at the upper end of the pricing scale, at around $200-$300. Khloe Kardashian posing in a Good American photoshoot. Online retailer ASOS is one of the most popular and accessible fashion labels among young women. They have a "regular" line and also a "plus size" line called ASOS Curve, which goes up to a size 28. Both are priced the same. "We do everything we can to help our customer find their fit, offering ASOS brands in more than 30 sizes and we're committed to providing all sizes at the same price," Design Director Vanessa Spence told news.com.au. "We want to ensure that all customers are given the same experience," Ms Spence said. "It's super important to us to promote a healthy body image. We're not about conforming to any stereotypes, we're currently working with more than 200 models to represent our audience and we do not artificially adjust photographs of models to change their appear." The Iconic's in-house clothing line Atmos&Here also has a "plus size" line, called Atmos&Here Curvy. Sizes range from 18 to 26 and prices go from $24.95 - $129.95. "Both of our Atmos&Here ranges are priced the same as we want to give all our customers the same shopping experience," said The Iconic's chief category management officer Mareile Osthus, adding that the "curvy" category is one of the website's fastest growing areas. "We posted an amazing shot of one of our 'curvy models' on Instagram and it ended up being our most engaged social post The Iconic had ever received to that date," she said. Ms Wassell says she hopes more brands like ASOS and The Iconic step up and implement fairer pricing systems. She argues it's simply bad business not to get on board. "New Look are already closing stores down," she said. "Retail at the moment is a really hard business to be in and they're not doing themselves any favours." The smaller New Look green-striped trousers. The larger dress is still more expensive, even after a sale deduction.